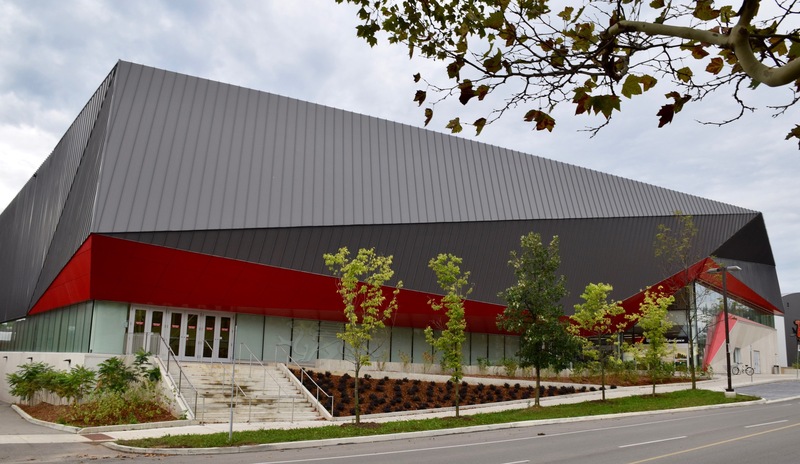 The University of Guelph’s state-of-the-art Guelph Gryphons Athletics Centre (GGAC) has received a prestigious international honour. The centre, which opened in early 2017, has been recognized with a Facilities of Merit award by Athletic Business, a multimedia magazine based in Wisconsin and dedicated to the sports industry. The annual awards honour sporting facilities based on characteristics including plan efficiency, interior and exterior design, and optimal use of space. “The submissions reflect the pinnacle of achievement in fitness, recreation and athletics architecture, with winning facilities ranging from a recreational centre in Lincoln, Nebraska, to a high-end aquatics facility in Tokyo,” said Andy Berg, the magazine’s executive editor. Scott McRoberts, U of G director of athletics, said the award recognizes the dedication and hard work of an exceptional group of stakeholders that included campus staff and students. This is the 38th year of the Facilities of Merit program, considered the oldest and most prestigious award program of its kind. U of G’s athletics centre is one of 10 award recipients this year. Berg said the judges praised the centre’s attributes, including its use of interior colour to create a sense of circulation and individual movement, and its comforting ambience within sophisticated floor plans and complex forms and spaces. One judge called the GGAC a well-executed facility at all levels, citing exceptional integration of interior and exterior, as well as its branding and vision for athletics and wellness. “It’s truly an honour to be an award recipient when you consider that, on average, only one out of every six projects submitted to the architectural showcase ascends to Facilities of Merit status each year,” Berg added. The winning facilities will be featured in the October print edition of Athletic Business and showcased at the AB Show in New Orleans in November, where a panel discussion with the winners will take place. Once the adjoining Student Wellness Services Centre is completed, he said, this area of campus will be a hub for health and wellness. It will also offer a more equitable and diverse social space with more amenities and services. “Another game-changer has been the amount of large, high-profile events that athletics and the campus community have been able to host that would not be possible without this state-of- the-art facility,” he added.